The Trusted Computing Group (TCG) is an industry organization that develops and promotes open, vendor-neutral, industry-standard specifications for trusted computing building blocks and software interfaces across multiple platforms. In an effort to enable more secure computing, TCG offers a portfolio of specifications implemented by vendors that manufacture PCs, servers, networking gear, applications and other software, hard drives, and embedded devices. In April, TCG members demonstrated products based on the Trusted Network Connect (TNC) architecture, an open solution for network security. The TCG also introduced a new TNC protocol, the Interface for Metadata Access Point (IF-MAP), which defines a publish/subscribe/search protocol that enables a wide range of systems to share data about network devices, policies, status, and behavior in real time. By integrating network and security components, IF-MAP can strengthen networks beyond simple admission control and endpoint integrity assurance to continuous post-admission assessment and control. Stringent performance is required in a broad range of computer applications, from enterprise-scale systems handling bookings and online financial transactions to compact systems embedded in software radios, cell phones, medical equipment, and vehicles. Whether their code is running on enterprise servers or embedded within devices, companies that design these mission- and time-critical systems tackle their shared challenges using similar design approaches. The Object Management Groupís (OMGís) modeling standards, including the Unified Modeling Language (UML) and Model-Driven Architecture (MDA), give designers powerful visual tools to build, execute, and maintain software and other processes. The groupís middleware standards and profiles are based on the Common Object Request Broker Architecture (CORBA). OMG can submit specifications directly into ISOís fast-track adoption process. The groupís UML, MetaObject Facility (MOF), and Interface Definition Language (IDL) standards are already ISO standards and ITU-T recommendations. OMGís ninth annual Distributed Object Computing for Real-time and Embedded Systems Workshop slated for July 14-16 will provide a forum for engineers to learn about new design approaches, share their experiences, and explore emerging standards. 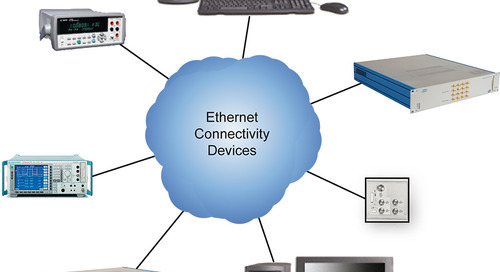 LXI is the LAN-based successor to the General-Purpose Interface Bus (GPIB). The LXI standard goes beyond GPIB to provide additional capabilities that reduce the time it takes to set up, configure, and debug test systems. LXI also helps integrators leverage the time and effort invested in system software and architecture. The LXI Consortium, a nonprofit corporation comprised of leading test and measurement companies, aims to develop, support, and promote the LXI standard. LXIís flexible packaging, high-speed I/O, and prolific use of LAN address the needs of various commercial, industrial, aerospace, and military applications. The LXI standard creates capabilities that optimize test throughput, overall system performance, and cost efficiency in a way that allows engineers to build powerful, Web-enabled test systems in less time. Last November, the LXI Consortium approved the latest version of the LXI standard (Version 1.2). To date, almost 500 products have been certified as LXI compliant, and annual LXI-equipped test and measurement system sales now exceed $200 million.